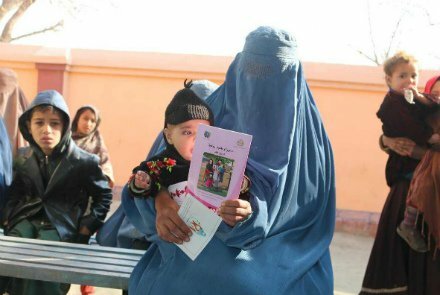 KABUL: In a World Health Organization (WHO) initiative, new mothers in Mir Bacha Kot district in Kabul have been receiving a tool to plan their pregnancy and protect their newborn babies – an all-in-one maternal and child health home-based handbook. This comes after the Ministry of Public Health agreed to allow the program to be carried out across the country. “The maternal and child health handbook was very well accepted by providers and families during the pilot phase. The Ministry has approved to scale up this project nationwide. JICA and UNICEF have allocated US$ 10 million for gradual implementation during the next 4 years,” said Dr Paata Chikvaidze, WHO’s Reproductive, Maternal, Newborn, Child and Adolescent Health medical officer in Afghanistan. More than 10,000 of these handbooks have been distributed since being introduced in Mir Bacha Kot district in June 2017 – as part of a pilot phase. In 2016, the Ministry of Public Health, with the support of WHO, developed the first prototype of the handbook. With funding from the Japan International Cooperation Agency (JICA), the Ministry of Public Health, WHO, UNICEF and partners worked together and tested it in two districts (Kama in Nangarhar and Mir Bacha Kot in Kabul provinces) for one year during June 2017 and June 2018. The handbook is designed as a collection of evidence-based essential health information to give pregnant women a way to keep track of their health situation and records and those of their babies. It can be used to monitor the health and growth of both mother and child before and after pregnancy, and even early childhood development. The handbook aims to improve linkage between health care providers, women, families and communities and it provides space for trained service providers and community health workers to record the health and growth conditions of mothers and infants – including a log for records of vaccinations, which serve as de facto birth certificates. They also provide information for mothers about pregnancy, delivery, parenting and birth spacing. These handbooks were well received by both health care providers and mothers, and the retention rate of these handbooks in the pilot areas was 99.5% among families. According to 2018 United Nations estimates, Afghanistan has witnessed about a 50 percent reduction in maternal deaths between 1990 and 2017. Child mortality has decreased by 62 percent. Despite these achievements, Afghan mothers’ and children’s mortality remains among the highest in the region. The introduction of the handbook is vital at this time and will play a role in reduction of maternal and newborn deaths in Afghanistan.